GLENGLASSAUGH has today (4 April) released its first batch of single cask bottlings. Revived from the dark and hand-selected by Managing Director and Master Distiller Billy Walker, there are eight phenomenal malts in Batch 1 which range from 45 to 28 years. All are crisp, fresh, sweet Highland malts that hit the palate with the power of complex fruit bombs – from apples, bananas, pineapples, grapefruit, prunes and plums to lime, cantaloupe melon and caramelised orange! The oldest, cask # 1601, 45 years old, was distilled in May 1968. Bottled at 44.3% vol, this autumn gold veteran is long and luxurious. On the nose, heady red candy apples balance with delicate spiced orange softening to distant pineapple juice. And on the palate, crisp oak spices soften to reveal elegant waves of fresh green apple and wisps of ripe banana. Delicate hints of passion fruit, cedar wood and lime zest bring a fantastic depth to the long finish. As a contrast, the youngest in the batch is a 28 year old distilled in February 1986. This rich amber beauty, cask # 2101, was bottled at 43.7% vol. On the nose, gentle heather honey holds warm cigar box spices. Crisp, freshly-ground barley surrounds soaked raisins and sultanas. And on the palate, a toasted white oak spice runs through Demerara caramelised orchard fruits which mellow to dried apricot and hints of vanilla in the long subtle finish. All eight are presented in a beautiful golden box. Out of my price range, however a real experience to sample. 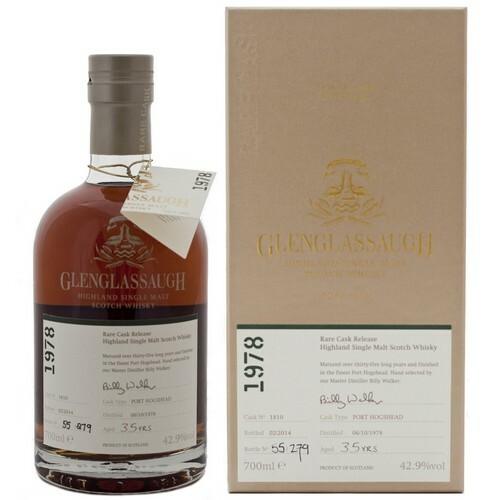 This is a beautiful old whisky expression from Glenglassaugh, complex and rich with a huge array of port and old oak wood flavours roiling around in it, simply a pleasure to drink.